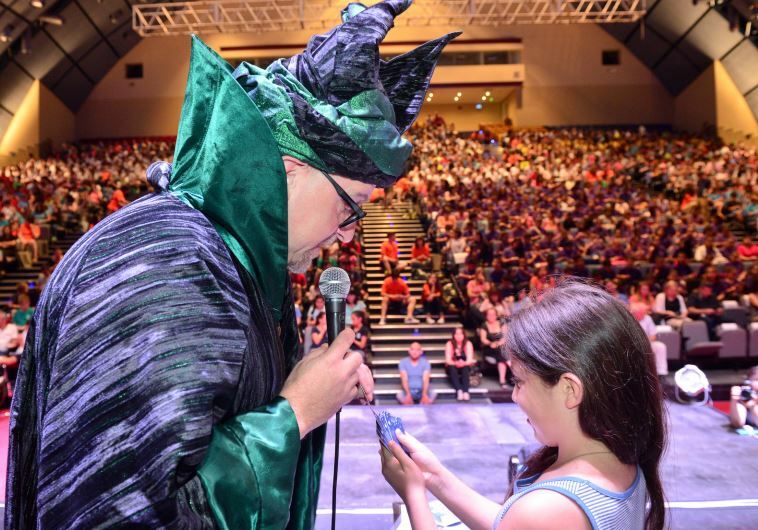 Israeli magician Cagliostro broke the record for the largest magic session at the Haifa International Convention Center on Monday morning. The session, teaching the new "Haifa Magic for Peace" trick, brought together 1,573 Jewish, Christian, and Muslim students from 25 schools across the city. "The world does not know that we here in Haifa have been living in peace for over a hundred years, I really want the whole world to know and learn this magic of peace that we live daily in the city." Every participant received a pack of cards, each card with a word relating to coexistence written on it, such as friendship, respect, and dialogue. After a lesson and practice runs in front of witnesses, a notary, and qualified surveyors, all 1,573 children and Haifa Mayor Yona Yahav performed the trick in unison, with the one card each participant chose flying out of their pack and into the air. "We have to enter the Guinness Book of Records with the Haifa Magic for Peace," said Yahav to the participating children. "The world does not know that we here in Haifa have been living in peace for over a hundred years, I really want the whole world to know and learn this magic of peace that we live daily in the city." The event was hosted in partnership with Beit HaGefen, a Haifa based Jewish-Arab Culture Center, the Haifa Municipality Department of Education – Department of Social Value Education, and volunteers from Maarag, a Tel Aviv based organization promoting multicultural society in Israel. Below is a very relevant question posed by a researcher at the Middle East department of Bar-Ilan University. This is one of many such stories that are very rarely brought into the open. The outbreak of mob violence against Baghdad Jewry known as the Farhud, or “violent dispossession,” broke out on June 1, 1941. During the two days of violence, rioters killed 180 Jews, wounded 600 others and raped an undetermined number of women. They also looted some 1,500 stores and homes. The Farhud was the beginning of what became a broad Nazi-Arab alliance in the Holocaust. The Farhud was both Nazi-inspired and encouraged by a prominent Arab leader, the grand mufti of Jerusalem, Haj Amin al-Husseini, who escaped from the British in Palestine and arrived in Iraq in October 1939. While everyone is familiar with the Palestinian Nakba, few in Israel are aware of the tragic history of the Farhud or the fate of the Jews from Arab countries who were chased from their homes, leaving all their property and possessions behind. This, even though these Jews and their descendants constitute over 55 percent of Jewish Israeli citizens today. Approximately 900,000 Jews left their homes in Arab countries between the years 1948-1970. Some of them came to Israel while others immigrated to other countries. Many were forced to leave behind property of great value – property that was sometimes seized by the governments of the countries they fled. Unfortunately nothing is taught by the Education Ministry about the pogroms suffered by the Jews in Arab countries, or of their rich and unique culture. Pupils are not exposed to the Farhud riots. They are not taught about the riots in Egypt and Libya in which hundreds of marauding Muslims desecrated, burned and destroyed synagogues in November 1945. Hundreds of Jews were killed just because they were Jews. The tragedy of these Jews has been downplayed and almost unheard of for many years. No one talks about the suffering of these refugees who were ousted from these Arab countries. No one speaks of the tremendous amount of Jewish property and wealth that was left behind. No one mentions the hundreds of synagogues or holy places, the numerous cemeteries or the communal property that was confiscated by the Arab governments, mainly by the Iraqi and Egyptian governments. There is a need to create a national committee to investigate the following subjects: the value of the property the Jews left behind; a documented list of personal and communal property of Jews in each country; the integration of the rich culture and legends of these Jews in the programs of the Education Ministry; the creation of a Jewish Cultural Center for Jews from the Arab countries; preservation of synagogues that remain in Arab hands; keeping watch over the holy places and shrines of the righteous and rabbis in these countries; and the restoration and prevention of the destruction of cemeteries in these countries. The question remains: why has Israel not demanded compensation for the Jewish properties left behind or stolen in Arab countries? Israel did little to break the silence about the dire circumstances of the Jewish exodus from Arab countries. Last year State Comptroller Joseph Shapira issued a scathing report on the state’s failure to take action toward the restoration of property that was lost when hundreds of thousands of Jews living in Iran and the Arab states came to Israel in the years after Independence in 1948. The Knesset and the Israeli government need to create a National Restoration Committee for Jews from Arab countries whose property was stolen. Education Minister Naftali Bennett should introduce more elements of Mizrahi Jewish culture into the education system. Our children must learn the culture of their grandfathers.